Celebrities are offering to feed the team lobsters and more. Chefs, rappers and celebrities are set on showing President Donald Trump "what an actual celebration dinner should be," after he served a spread of McDonald's Big Macs, Domino's Pizza, fries and more to the NCAA college football national champion Clemson Tigers at the White House on Monday. Trump called the dinner "great American food," but Nick Kokonas, the co-owner of Alinea — the only Chicago restaurant with three Michelin stars and No. 34 on the World's 50 Best Restaurants list — thinks otherwise. While Kokonas said he could "care less" about college football, he invited the Clemson Tigers to Chicago over Twitter to eat at his restaurant, where one meal can go for hundreds of dollars. "I'm not joking," he wrote. "It'll be worth it." "Nothing wrong with fast food from time to time. But when you knock off a national championship, it's time to teach our youth that there are experiences to strive for in life moving forward," Kokonas tweeted. "Plus... in the White House? No." White House Press Secretary Sarah Sanders said in a statement Monday that Trump personally paid for the catered fast food because much of the White House residence staff is furloughed due to the longest-running government shutdown that is now in its fourth week. 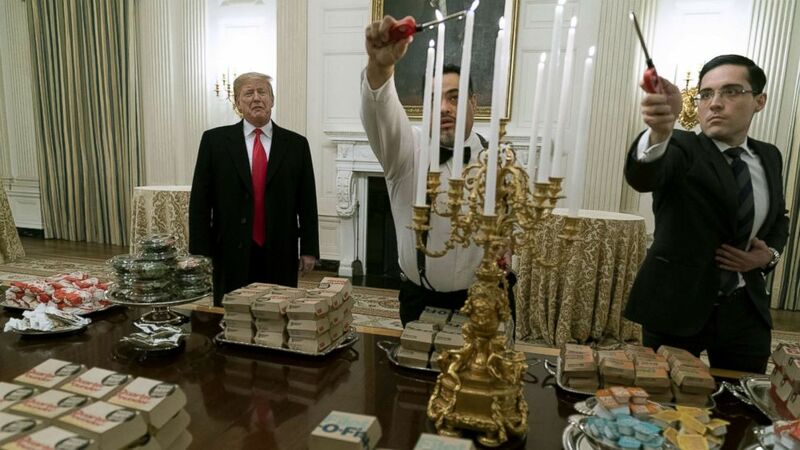 (Chris Kleponis/Getty Images) President Donald Trump presents fast food to be served to the Clemson Tigers in celebration of their national championship at the White House, Jan. 14, 2019. Quavo, a member of the hip-hop trio Migos, tweeted that he wanted to show the football team "how champs are supposed to be treated," and invited them to come by the record label Quality Control Music's headquarters "anytime." Trevor Lawrence, the Tigers' quarterback who called the trip to the White House "awesome" on Twitter, responded to Quavo's tweet with two "mind-blown" emojis. Good Morning America's Michael Strahan invited the team to join the show for lobster, and maybe some caviar too. "Whatever you want, we're going to take care of you. We're going to give you the proper meal you deserve," Strahan said on-air Tuesday. "I'll pay for it." And Ayesha Curry, celebrity cook and wife to NBA star Stephen Curry, tweeted that she'll show the Tigers a real feast with "no 10 cent dipping sauces on silver platters." @eatatsmoke will gladly feed the Clemson Tigers any day. A real feast and celebration. No 10cent dipping sauces on silver platters ???????????????????? ?